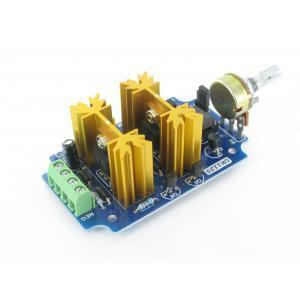 This controller allows controlling both the Speed and Direction of a DC motor using a Pulse-Width-Modulated (PWM) DC voltage with a Duty Cycle fully adjustable from 0 to 100% (both Positive and Negative DC output). It can can provide up to a maximum continuous current of about 7A out of the box, and up to 10A to 15A with the addition of an optional fan (Model No. 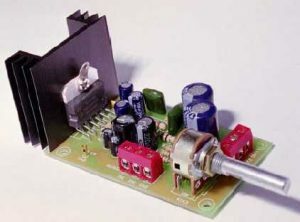 FAN-12VDC) and reinforcement of PCB tracks. Traditionally, switches are used to reverse the polarity of the voltage applied to a DC motor in order to change the rotation direction. However, this method requires use of DPDT switches and causes the voltage applied to the motor to suddenly change from full positive to full negative. The sudden change while the motor is spinning leads to a high level of mechanical stress on the motor as well as high current surges that can cause damage to any electronics in the path. 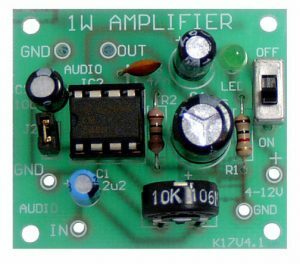 Using a Full H-Bridge circuit, the solid-state design of this motor speed controller does not use any mechanical switches and allows the control of both speed and direction through a single potentiometer. At its center position, the motor will be forced to stop (i.e. it brakes). Turning the potentiometer clockwise will cause the motor to start spinning slowly in the positive direction, with increasing speed up to the maximum supply voltage at it’s maximum position. Turning the potentiometer in the counter-clockwise direction will cause the motor to spin in the reverse direction, again starting slowly up to a maximum negative supply voltage. Note that in it’s center position, the motor will actually brake (motor terminals will be grounded) forcing the motor to stop rather than be in a “floating” or coasting position. As an added option, the controller allows for selection of two operating PWM frequencies: 100 Hz or 200 Hz . Fully adjustable from 0 to 100% Duty Cycle in both directions. More common uses include controlling DC motors in golf carts, buggies, RC cars, robotics, DC hobby motors, toy DC motors, etc.